Please see below for a list of the ingredients and their definitions in the NuVet Plus Feline Formula. 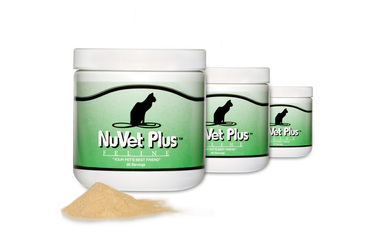 NuVet Plus Feline Supplement is not available in stores and must be purchased by a pet professional like Victorian Gardens Cattery. Please use code: 96593. Comes with a 60-Day Money Back Guarantee. If a NuVet customer is not 100% satisfied with the results, you can return the bottle to NuVet for a refund. Please see their website for complete details. For some time now, Victorian Gardens Cattery has been looking for a good supplement for our cats and kittens at the Cattery, as well as for all our Adoptive Families. I wanted a supplement that would need to be in powder form in order to easily feed it to my Cattery cats and kittens. I also wanted a supplement that included a Digestive Enzyme in it, since I was already adding that manually to the food. I wanted more Folic Acid in the supplement since it was important for my pregnant mothers and the babies in the womb. I wanted more Taurine in all my cats diets since it is critical for heart function. Well, another breeder asked for my opinion about NuVet. I really had not heard of it and really was extremely busy at the time. So when a Sales Manager at NuVet called me and said she would send some samples to try, I knew I had to buckle down and do my homework. For years we had been using Kitty Bloom VM-900 for our pregnant mothers. However, we could not use Kitty Bloom VM-900 on any male kittens/cats for fear of urinary tract blockages that the Kitty Bloom's high mineral content brought on. So I put all the correct questions and concerns out to NuVet. It seems that NuVet Plus Feline Supplementation had more in it than I even bargained for. I liked what I heard and read but the real test would be IF my cats and kittens would like it. So I started measuring out their dry food and tossing the NuVet Plus Feline supplementation in their food and mixing it up to coat. Well, my gang loved it. The 6 week old kittens loved it. If that was not enough, I am thrilled that it has the following additional ingredients in it that many other pet supplements just do not have and that were not even on my radar. I was also very happy to see that this formula included Ester C which is my personal secret go to vitamin to beat a cold that might be coming on. Ester C really works for me personally. That really impressed me. Kittens and those under 5 lbs would get 1/2 teaspoon a day. Adults or those over 5 lbs would get a teaspoon a day.